The Kimberley Land Council has unveiled a special 40th anniversary exhibition of photographs taken during one of the most influential land rights disputes in Australian history. 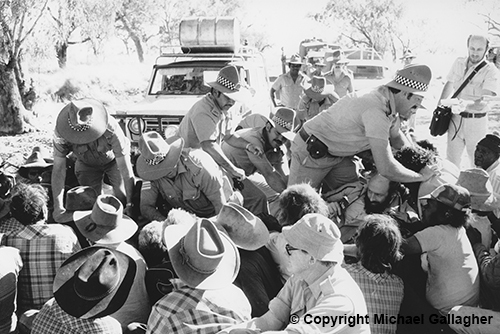 The rarely exhibited images depict crucial moments during what is known as the Noonkanbah dispute – a land rights dispute involving an international mining company called AMAX, the Western Australian Government and Kimberley Aboriginal people, which ran from the late 1970s. The images are the work of former Kimberley Land Council photographer Michael Gallagher. Kimberley Land Council Acting Chief Executive Officer Tyronne Garstone said the Noonkanbah dispute was a “David and Goliath battle”. “AMAX wanted to drill for oil at a sacred place, but the people decided they’d had enough of mining companies coming onto their land and destroying their sacred sites,” Mr Garstone said. “The people put their position forward, they petitioned the government and when that failed they marched for their rights and blockaded the path to the drill site. The Kimberley Land Council was formed at Noonkanbah in 1978 and played a key role is supporting Kimberley Aboriginal people throughout the dispute – a galvanising period in the organisation’s 40 year history. Mr Garstone said what people were fighting for at Noonkanbah, remains the same today – protection of culture and heritage. “In 1978 when the KLC was formed there was no Mabo decision, there was no native title and there was no apology,” he said. ‘We have come a long way since 1978, but the fundamentals of what people were fighting for then and what they are fighting for today, remain the same. Kimberley Land Council Chairman Anthony Watson remembers the Noonkanbah dispute. His father, Mr John ‘Darraga’ Watson, took part in the historic Noonkanbah march and was one of the men arrested at the blockade. While challenges remain for Kimberley Aboriginal people, Mr Watson said 2018 is a time for celebration and reflection on everything the Kimberley Land Council has achieved. “Since 1978 Kimberley Aboriginal people have been united, speaking with one voice through the Kimberley Land Council,” Mr Watson said. “Our organisation works at the grassroots, but we aren’t afraid to speak loudly and strongly on the national and international stage. “We will always stand up for our mob, like when the WA Government wanted to close our communities, and we always speak up for our native title and human rights. “I am proud to be Chairman during this 40th anniversary and look forward to seeing all of the Kimberley mob at our big celebration at Ngumpan later this year. The Noonkanbah exhibition will be displayed during the National Native Title Conference in Broome and will include a special presentation by photographer Michael Gallagher on June 6 at 12.50pm. The exhibition will also be shown at the KLC 40th anniversary celebrations at Ngumpan in September.